Recent set up. 1994 Heritage 575. A real Gibson? Interesting guitar. Solid maple front and back as opposed to laminates. A different beast than the ES-175 but a good different. Work done: Re-slotting of nut (string height higher than needed), truss rod adjustment (responded nicely), slight fret dressing on the dreaded finger board “bump” that so many archtops seem to be inflicted with. Best bet for that is planing of the finger board when it gets its first re-fret. 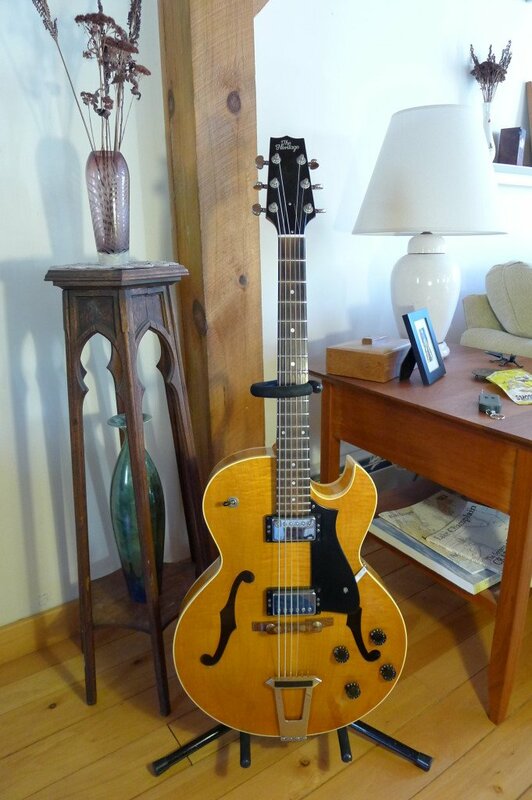 A cool guitar and can be found used at very reasonable prices since for whatever reason (most likely lack of promotion), Heritages re-sale is a bit flat compared to Gibsons……………………go figure………..that Gibson corporate voodoo just keeps doing what it does so well.